The RRP of the tile cutter alone is £101.04 (+VAT)! The Bronze Kit is ideal for beginners to tiling and tilers working predominantly with ceramic tiles. 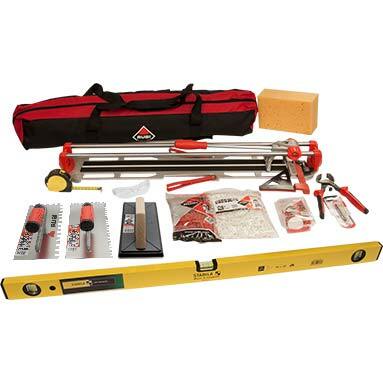 Rubi Star MAX 65 tile cutter - with carry bag. Ideal for cutting tiles up to 65cm in length & 12mm in thickness. New & improved version of the Star-60-N-Plus cutter. With re-inforced support for durability and greater separation power. New ergonomic comfort handle. Includes 6mm scoring wheel. Delta Plus Brava clear anti-scratch safety glasses.